L: 73" x W: 42" x H: 42"
Jasper Power-Reclining Loveseat The casually contemporary Jasper power reclining loveseat is so attractive. Its power adjustable headrest makes it easy to recline and still view your favorite TV show. Plush, padded upholstery and sleek track arms make Jasper handsome and cozy. With a USB port conveniently located next to the one-touch power control buttons, you'll need a great reason to get up from this loveseat. The casually contemporary Jasper power reclining loveseat is so attractive. Its power adjustable headrest makes it easy to recline and still view your favorite TV show. Plush, padded upholstery and sleek track arms make Jasper handsome and cozy. With a USB port conveniently located next to the one-touch power control buttons, you'll need a great reason to get up from this loveseat. Very happy with our new love seat, the power recliner is great! Love the console and cup holders. I saw this same piece at a different company and it was 100. more, so the price was good. The sales people were very accommodating and professional. After much searching and visiting many stores, we finally found what I was looking for. Not too soft and not too hard, just right. The adjustable headrest makes for even more comfort. The color is great for transitioning from a beige room to more current grays. Will be making Raymour & Flanigan our new favorite store. Excellent customer service. Love the color , the style the quality . 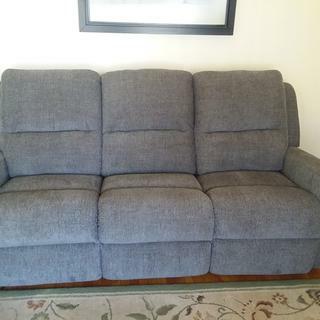 Very very nice..comfortable..clean style design..
We really like the setup we got from Raymour & Flanigan This piece in general was a great choice and fits in the room very nice. I absolutely love this reclining love seat. 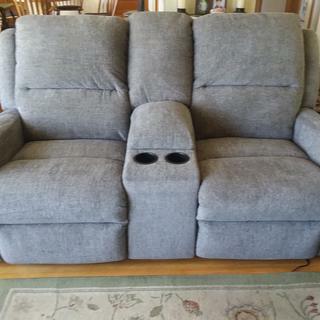 It is very comfortable, I looked around for a long time and finally found this one. So glad I got it. The loveseat is beautiful. It was a pleasure dealing with Raymond and Flanigan. Bought this online - site unseen! Was so happy when it was delivered exactly as it was described and pictured. It's so comfortable I fought with my fitbit all weekend yelling at me to get up and get my steps in! Nice but not that comfortable. Its firmer than I expected so I'm still trying to adjust to it. I might have rushed trying out different loveseat and ended with a semi- comfortable one. The color and material go well with my decor. I purchase the set. after 3 month I cant even sit on them the static is unbearable. I have insurance but they only cover motor and don't care about any other problems. the feeling of shrock hurts especially on children. buyers beware. raymour is no help. maybe its the fabric. is anyone else going through this nightmare ??????? Is it available to see in nj stores? What is the seat depth and is this a wall hugger reclining loveseat? BEST ANSWER: The seat depth is 22" and is a wall hugging recliner.